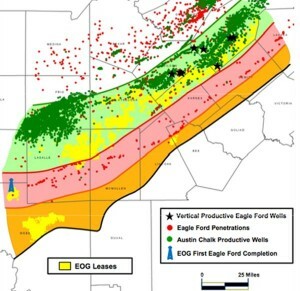 EOG Resources' Eagle Ford assets continue to deliver. The company brought on the largest producing well in the play to date in the second quarter. The Gonzales County Boothe Unit #10H came on line at 4,820 bpd of oil, 972 bpd of NGLs, and 4.5 mmcfd of natural gas. That's more than 6,500 boe/d from one well. Better yet, the Boothe Unit #9H, an offset well in the same unit, produced over 4,600 boe/d when it came online. The company expanded its marketing options when the Enterprise's Eagle Ford Crude Oil System came online over the summer. The 24-inch oil pipeline gives the company direct access into the Gulf Coast refinery market. Enterprise also commissioned a natural gas processing plant being utilized by EOG. EOG will also continue to test down spacing across the play. 65 to 90-acre test have had very strong results and tighter spacing tests are in the works. Read more quotes from the company's press release at our EOG Resources page.